The Tiffany Network’s news division is making some news of its own. 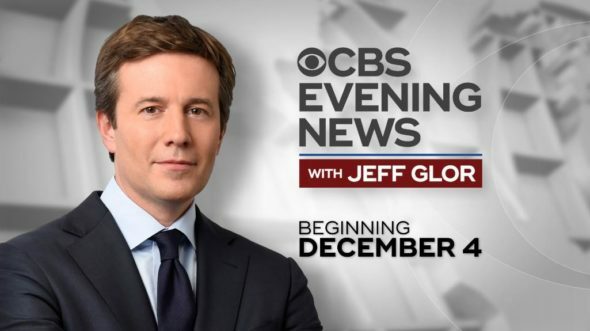 CBS has announced that Jeff Glor will anchor CBS Evening News beginning Monday, December 4, 2017. Glor will replace Anthony Mason, who has been anchoring the broadcast on an interim basis since June of this year, when Scott Pelley left the desk to join 60 Minutes. Pelley first began anchoring in 2011, when he replaced Katie Couric and Bob Schieffer on the CBS Evening News. Learn more from this CBS press release. Jeff Glor, a veteran CBS News journalist, will officially take the reins as the new anchor of CBS EVENING NEWS on Dec. 4, the Network announced Sunday. “I’m thrilled to be a part of the immensely talented team at the CBS EVENING NEWS and be a part of its future,” Glor added. “Jeff is a thoughtful, probing journalist with the versatility to anchor in any circumstance – from daily reporting to the most significant events of our time,” Rhodes added. Glor has reported across the globe for virtually all CBS News broadcasts and digital platforms in his 10 years with the Network. He has anchored numerous breaking news stories, including most recently in the field for Hurricane Irma and in the studio for the Las Vegas shootings. Glor was a lead anchor on CBSN, CBS News’ 24/7 streaming news service, during its critical launch period. As CBSN continues to grow, Glor will maintain a prominent presence on the digital streaming channel. Glor, 42, joined CBS News in 2007 as a correspondent based in New York. He covered some of the biggest breaking news stories of the last decade, including the shootings at Sandy Hook, the Boston Marathon bombings, and the landfall of Superstorm Sandy. He won an Emmy in 2011 for a CBS SUNDAY MORNING story. Glor has traveled around the world to bring original reporting to CBS News viewers. Recently, Glor reported from Alaska on permafrost degradation and was in Jackson, Wyo., for the first solar eclipse visible coast to coast since 1918. He also reported on how NASA engineers are working to bring supersonic travel back to commercial aviation with lower sonic booms. As a correspondent for CBS THIS MORNING and 60 MINUTES SPORTS, Glor filed reports recently from Greenland, Newfoundland, Alaska, Africa and Ireland, to name a few. For the CBS EVENING NEWS, Glor’s ongoing series of reports on the recall crisis at General Motors and Takata sent him across the U.S. to find survivors, stories and information that were kept hidden from the public for years. What do you think? Are you familiar with Jeff Glor’s reporting? Do you plan to tune in to watch him on the CBS Evening News broadcast? Let us know, below. More about: 60 Minutes, 60 Minutes: canceled or renewed?, CBS Evening News, CBS Evening News: canceled or renewed?, CBS TV shows: canceled or renewed?